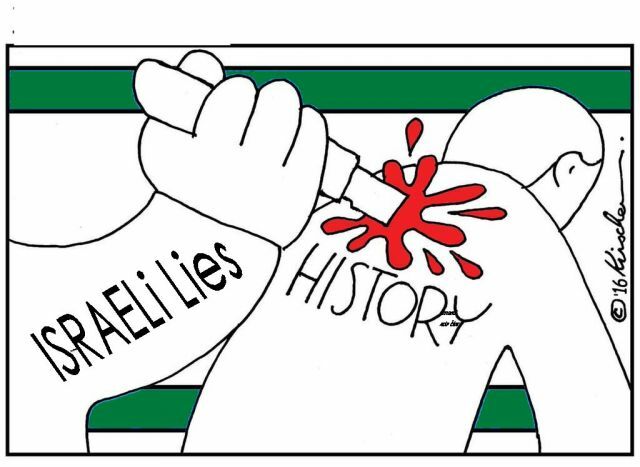 One of the first of Israel’s Big Lies was to link the Palestinians to the Nazis. Although Arabs — including Palestinians like my father, by the way — fought against the Nazis in Europe during World War Two (ironically, helping to free the surviving Jews from the concentration camps), Israeli propaganda has asserted falsely that the Palestinians were behind the Nazi drive to exterminate the Jewish people. Freda Kirchwey wrote dozens of stories for the anti-Arab publication The Nation, which was a “mouthpiece” for the Zionist cause that fed the ignorance of naïve American and Western audiences ignorant of the facts about Palestine and the Middle East. Kirchwey’s stories falsely asserted that Palestinians were the originators of the plan to exterminate Europe’s Jews in the Nazis’ “Final Solution”. To justify this libel, she pointed to the fact that Hajj Amin Al-Husseini, the Mufti of Jerusalem who had been targeted by the pro-Jewish British Mandate during the late 1930s and World War Two, had met with the Nazi leadership. Of course Hajj Amin would meet with the Nazi leaders at the start of the war because Germany was the only country opposed to transforming Palestine into a “home for the Jewish people”; why wouldn’t he? The Western news media was dominated at every level by anti-Arab haters like Kirchwey who took extreme liberties with the truth. There were no Arabs working in the American news media at the time to counter such lies. This entry was posted in News and politics and tagged False stories, Freda Kirchwey, Israeli lies, Liar, The Big Lie. Bookmark the permalink.